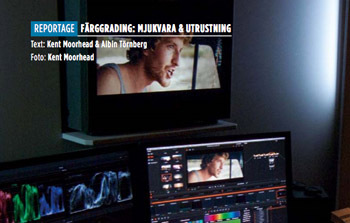 Kent Moorhead began writing for the Swedish film magazine, Monitor with an article about the Motion Picture Academy of America (the Oscars) and their warning about the crisis of digital storage for film. Don't know about that? You can read the article to the right, provided you read Swedish. If you don't, an English language version is on its way. The most important thing about technical writing is researching the subject until you thoroughly understand it. Only then is it possible to explain it to the reader. It doesn't matter whether its a review of equipment or software, studying a production technique, or doing a profile or interview with someone in the industry. Moorhead has been both a participant and observer of the film industry since his training in New York at NYU's Film School in the late 1970s. He's worked on films in a wide range of roles and been on sets as an observer in Hollywood and New York as well as smaller production centers such as North Carolina and New Orleans. Now he is studying the film branch in Sweden. Several of the articles have been co-written with Albin Törnberg, his step-son and a past collaborator on film projects. Kent Moorhead studied writing at NYU under Arnaud D'Usseau, a Broadway playwright who was blacklisted in Hollywood during the 1950s. Moorhead has been working at the craft ever since. 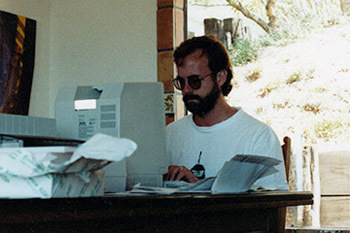 To the left he is working on a screenplay during a stint in L.A. in 1991. After starting Passage Film he partnered with Pia Moorhead Törnberg to write documentary scripts for the many films they have produced together. Törnberg is a gifted writer who has had a long career as a journalist with Swedish Radio. She also taught journalism for twenty years at JMK, the journalism college in Stockholm. Her specialities are interviewing techniques and scrutinizing the role of lobby firms in society. Writing short form TV, especially ad copy, means telling a story with few words. When Moorhead ran his previous company, Forever Young Productions, this kind of work kept the business going and paid for his documentary work. 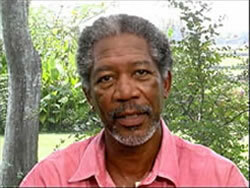 An early highlight was writing public service advertisments for the University of Mississippi which featured Morgan Freeman (Moorhead also directed the spots).